The Wet Mountain Valley in south central Colorado lies between the Wet Mountains to the east and the Sangre de Cristo mountain range to the west. The towns of Westcliffe and Silver Cliff sit at an elevation of 7800', and look up to nearby peaks of 14,000' and beyond. The Sangre de cristo mountains receive the bulk of the area's snowfall, and the runoff results in vast mountainside forests of aspen, evergreens and wildflowers along with the lushness of the valley floor. 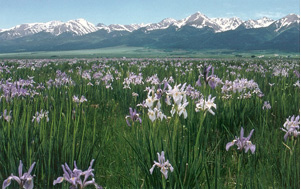 Though access is not difficult, Westcliffe is certainly off the beaten path. Via paved state roads which tie into US 50 and I-25, Denver is only 3 hours away, Colorado Springs 1 and 1/2 hours to the northeast, and Pueblo only one hour to the east. Most county roads are dirt and gravel, and maintained for year round access. 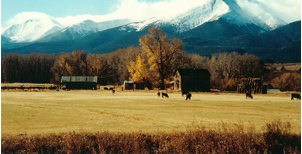 Westcliffe is not really a "resort" town, but essentially a ranching and farming community. Production of livestock and grains generate most of the valley's revenues. However, a substantial number of Westcliffe residences are seasonal or recereational. Although sparsely populated, the community offers a library, public school system and cultural events from rodeos to Jazz, art shows to live theater. There is a wide range of social, civic, and church groups in which to participate as a resident or as a visitor to Westcliffe. Recreational opportunities abound due to the natural topography and pleasant climate: camping and hiking the hundreds miles of trails in the National Forests, including the Rainbow Trail and its offshoots; fishing the numerous pristine mountain creeks and lakes; water sports at Lake DeWeese in town or on the Arkansas River nearby; hunting large and small game throughout the area; mountain climbing; a day at St. Andrews public golf course; horsebackriding on your own or with one of the area outfitters; winter snowmobiling and cross-country skiing. Not too far away you can find hot springs or enjoy alpine skiing at some of the nation's most well known resorts. To those who live here or just visit, Westcliffe is a special place indeed. The unspoiled beauty, friendly rural atmosphere, dry and sunny climate, numerous recreational opportunities and rich history combine to make a relaxed and comfortable lifestyle which draws and holds those who appreciate an alternative to city living. "Nil Sine Numine" goes the official motto for Colorado. "Nothing Without Providence." With that in mind, one could well conclude that the future of Custer County will be as intriguing, fulfilling and as providentially promising as the county's incredibly fascinating past. Though it's 730 or so square miles make it one of Colorado's smallest counties, Custer County's heritage is out-sized and world-class. From mastadon-hunting bands of ancients to the Spanish conquistadors to the likes of Kit Carson, all have had good reason to spend time in this high mountain valley. When the first settlers arrived in the Wet Mountain Valley less than 140 years ago, there were vast opportunites-and sometimes vast setbacks-awaiting. Miners, farmers and ranchers, and anyone else willing to work hard could scratch a living amidst this alpine splendor that has beckoned mankind from the beginning. So it is today. Though ranching remains an important element of the local economy, real estate "for sale" signs have replaced prospector holes as a road to riches. There are no more livery stables or blacksmith shops; today it's the tourist gift shops and espresso cafes that fill the business district. And there's still gold in them thar hills, but now it comes from tourists drawn to our two federal wilderness areas. In spite of these changes, today's Custer Countian has plenty in common with his or her predecessors: a Western conviction of self reliance and rugged individualism coupled with a strong connection to the great outdoors which defines Custer County as much as anything. One hundred years ago, real-life threats here included severe weather, geographic isolation, and unstable mining and agriculture markets. Residents these days face not only those challenges, but more modern-day concerns like population growth, water demands and other issues which can impact the valley's very way of life. Most residents and visitors agree that Custer County is one of the few places left where landscapes have changed little and where modern life meshes so naturally with the past. Protecting the land, the water, and the rural lifestyle here is a goal of nearly everyone. There's no crystal ball to tell us what Custer County will be like in a decade or a century from now. But if providence continues to shine on us as it has in the past, it's not unreasonable to believe it will be as special a place then as it is now.